YEREVAN (RFE/RL)–The National Assembly allowed President Robert Kocharian on Tuesday to extend by another year Armenia’s modest military presence in Iraq. Lawmakers voted by 79 to 10, with 11 abstentions, for an appropriate motion put on behalf of Kocharian by Defense Minister Mikael Harutiunian. The Kocharian administration decided to send a small military force to Iraq three years ago despite strong domestic opposition stemming from fears of terrorist reprisals against the war-torn nation’s Armenian community. The 46 Armenian sappers, military doctors and other non-combat army personnel rotated every six months have been serving there as part of a Polish-led multinational division. Addressing the parliament, Harutiunian described Armenia’s participation in the U.S.-led occupation force as a "humanitarian mission." He stressed the fact that the Armenian troops in Iraq do not take in combat operations. Not all lawmakers were convinced. 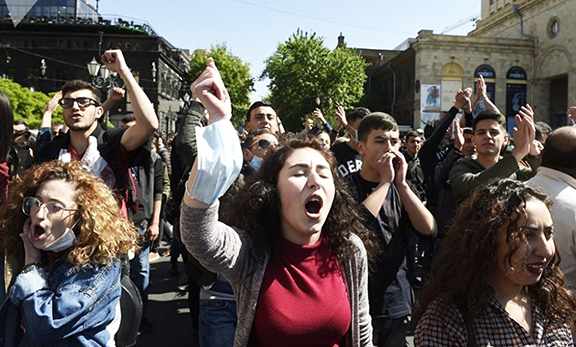 Deputies from the Armenian Revolutionary Federation party voted against the extension or abstained. The Armenian military deployment in Iraq highlighted Armenia’s growing military ties with the United States. Prime Minister Serzh Sarkisian underscored the mission’s political significance for Armenia when he visited Iraq in November 2006 as Defense Minister. Addressing the parliament upon his return to Yerevan, he said the largely symbolic troop presence "adds to Armenia’s international standing." Neither Sarkisian, nor other Armenian leaders have set any deadlines for the contingent’s eventual withdrawal.